Not huge fans of posting gratuitous crash pictures here but, sometimes you come across one of such implied dooshbaggery that it deserves the ridicule. 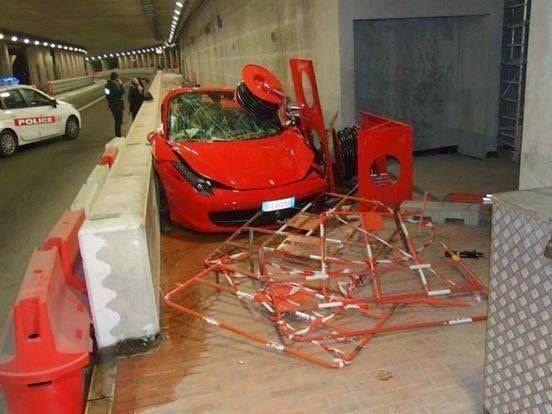 How this person managed to stuff a 458 Italia over the jersey barriers of the 25 mph speed limited tunnel under the Fairmont Hotel in Monaco is a mystery. We're guessing it might involve an epic fail in creating yet another "Ferrari blasting in a tunnel" car spotter video? It certainly deserves a medal for creativity. Lucky that at the time nobody was on that pedestrian walkway so only egos, wallets, aluminum and some sort of firefighting station were harmed here. UPDATE: It was Pastor Maldonado!..... OK no, just kidding. 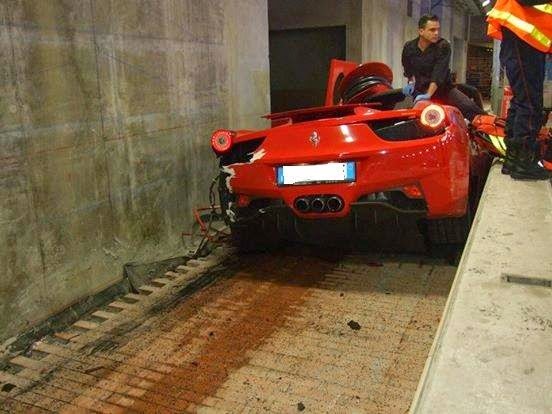 Yeah this Ferrari fail definitely deserves a medal, but the gold medal still goes to Eddie Griffin when he drove that Enzo into the barrier. Its amazing that when he hit the barrier, thankfully, he didn't hop the the barrier. There was a reporter standing just a few feet away. I liked the way his only response to destroying a Maranello Masterpiece was, "Undercover brother is good at karate and the rest of that...but a brother can't drive!!!!" Eddie, I concur. Stick to pimpin'. Thimbledicks are a constant all over the world. Oh wait, maybe not, because this is Europe. Undercover Brother is a great movie!